On April 17, 1945, less than three weeks before the liberation of the Netherlands, Hannie Schaft, a resistance fighter from Haarlem, was shot by the Germans in the dunes near Overveen. She was only 24 years old. This young woman who was also known as ‘the girl with the red hair’, had been active in the armed resistance and was responsible for the assassination of five collaborators. Hitler himself had demanded her arrest, urging the Sicherheitsdienst (SD) to find her. In his eyes she had made a mockery out of the German intelligence service. The SD succeeded and Schaft received the highest penalty for her ‘crimes’. She was one of the very few female resistance fighters executed by the German occupiers during WWII. Jannetje Johanna Schaft was born in Haarlem on September 16, 1920. Her family and friends called her Jo or Joop, but once in the resistance she started to use the name Hannie. Her father, Pieter Schaft, worked in education and was an active member of the Dutch Social Democratic Party (SDAP). Her mother, Aafje Talea Vrijer, had also worked in education, but quit working once she got married. Schaft had a sister called Annie, who was five years older, but died of diphtheria when she was only 12 years old. The family was devastated and consequently Pieter and Aafje became very protective of their daughter. Hannie’s friends remember that even when it was very warm outside, Hannie was always wearing a cardigan. Apparently her parents were terrified that their daughter would catch a cold. Because of her protective parents, Hannie grew up socially isolated. She was very shy and didn’t have many friends. Her classmates thought of her as a bit frumpy and teased her because she had red hair and lots of freckles. This didn’t stop Hannie from excelling in school. She was a very bright student and finished school at the top of her class. After finishing high school in 1937, Hannie decided to study law at the University of Amsterdam (UvA). She specialized in international law, because she wanted to work in Geneva for the League of Nations, the predecessor of the United Nations. This goal was no surprise considering the fact that her parents were politically active and socially aware. At home, Schaft was used to discussing politics and current affairs with her parents. She was raised with socialist ideas and values like social justice and equality. Hannie’s old school essays underline these values, but also her interest in the international situation of the 1930s. The rise of Hitler and the dangers of his national socialist party were reoccurring topics. 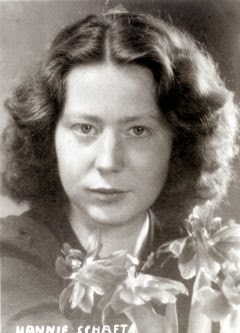 Hannie moved to Amsterdam in 1937 where she joined the Amsterdamse Vrouwelijke Studentenvereniging (AVSV), an organization for female students. Within AVSV, along with two other students, Hannie founded the Gemma society. It was here that she met two Jewish students, Philine Polak and Sonja Frenk. The three girls soon became best friends. After the German invasion of Poland on September 1st, 1939, Hannie decided that something needed to be done. Together with her friends she helped imprisoned Polish army officers by sending parcels via the International Red Cross. On May 10, 1940, Germany invaded the Netherlands. After a five day war and 2,300 fatal casualties, the Dutch army capitulated. The Germans occupied the Netherlands and after a few days of general panic, Dutch citizens returned to their daily routines. In December of that same year, a group of Jewish lecturers and students were made to leave Hannie’s university, which caused a lot of outrage. Fights on the streets of Amsterdam started to occur more regularly and the general atmosphere took a significant turn. In February 1941, a mass strike took place in the Dutch capital, which was a protest against the raids conducted by the Nazis in Amsterdam’s Jewish neighbourhood. This general strike, in which tens of thousands of people participated, was one of the first direct actions undertaken by non-Jewish citizens against anti-Jewish measures of the Nazis in occupied Europe. Hundreds of people, organizers as well as participants, were arrested, deported and executed in the months following the strike. From this moment onwards the resistance intensified and several existing groups started to cooperate in an attempt to create a national resistance. It was then that Hannie also became active and took part in several protest marches. When Dutch Jews were forced to wear a yellow star of David in the spring of 1942, Hannie became more radical and began to get involved in more dangerous initiatives. She attended all sorts of public events with unattended cloakrooms, like swimming pools, theaters and concert halls. Here she stole identity cards, which were then forged by the resistance and given to Jews. Two of the people she helped this way were her friends Philine and Sonja. Besides stealing ID cards, Hannie also helped Jewish people to go into hiding. Some people were put up for a few nights at her parents’ house, before they were moved to safe addresses in the country side. When the Germans found out that students were responsible for two attacks in Den Haag in February 1943, they decided to raid universities all over the country. Hannie’s university, the UvA, was one of them. The Nazis introduced strict regulations which required, among other things, that only a certain amount of students were allowed to attend university and that every graduated student had to work in Germany for a period of time. Furthermore, all students had to sign a declaration of loyalty. Like 85 per cent of Dutch students, Hannie and the members of her Gemma society refused to sign this declaration. Consequently university life was severely disrupted. Classes were taught and exams were given ‘underground’. Hannie finished her law degree when she did her final exam in a café at Amsterdam’s central station. She then moved back to her parents’ house together with Philine and Sonia. From 1944 onwards the trio’s resistance activities focused mainly on the assassination of collaborators, in particular those within the Dutch police force. Hannie was eventually shot when her gun jammed during an attack on a ‘dirty’ detective named W.M. Willemsen. She survived and went into hiding, continued her activities as soon as the gunshot wound in her leg had healed. Unfortunately, Hannie had been seen by someone who witnessed the assassination attempt. She was described as “the girls with the red hair” and the SD started a national search. The SD caught her during a random check on March 21, 1945. The two soldiers in charge found underground newspapers in her pannier and a handgun in her handbag. She was taken to the Amsterdam house of detention on the Amstelveenseweg by Emil Rühl, a German SD member. He soon realized that the arrested girl in his car was ‘das rothaarige Mädel’, a wanted resistance fighter. Hannie was interrogated intensively and she admitted being responsible for five assassinations, but didn’t give the Nazis any names of fellow resistance fighters. Three and a half weeks after her arrest Hannie was taken to the dunes just outside of Overveen. She was shot in the back of the neck by the Dutch detective Maarten Kuijper, a collaborator who was known for being exceptionally cruel. On November 27, Hannie Schaft was buried in the same dunes where she was shot. Together with 421 other victims found in this area, she was laid to rest at the Bloemendaal Memorial Cemetery. Queen Wilhelmina, princes Juliana and prince Bernhard attended the funeral ceremony which attracted thousands of people who wanted to pay their respects to this brave young woman. Wilhelmina called her a ‘symbol of the resistance’ and bestowed a decoration of honour on her. Hannie was also decorated posthumously with the “Medal of Freedom” from General Eisenhower. Under influence of the Cold War, which had a huge impact in the Netherlands, non-communist resistance fighters became increasingly annoyed that communist youth organizations and the Dutch Communist Party (CPN) organized yearly commemoration ceremonies in honour of Hannie Schaft. Communists were accused of portraying Hannie Schaft a s a communist heroin, a symbol for the communist resistance. She became a role model, particularly for Dutch communist youth. Heated debated about Hannie Schaft’s political beliefs followed and people wondered if Hannie had been a communist or not. Nobody knows for sure. All we know is that Hannie distributed the communist newspaper De Waarheid (The Truth) and worked together with communists, like Truus and Freddie Oversteegen. The memory of Hannie Schaft became something of a political football during the Cold War. Her name and memory were discredited and as such she became a victim of the Cold War. What made matters worse was the publication of a novel called ‘Het meisje met het rode haar’ (the girl with the red hair) written by communist author Theun de Vries. The book became available in November 1956, just weeks after the Soviet Invasion of Hungary. Hannie Schaft and her political persuasion were once again the topic of heated debate. De Vries was accused of portraying Hannie as a partisan heroin inspired by Russia. Because of these prevailing Cold War attitudes, it wasn’t until 1982 that a memorial in honour of Hannie Schaft was erected in her birthplace Haarlem. A bronze statue called ‘Vrouw in het Verzet’ (Woman in the Resistance) was unveiled in the Kenau Park by princes Juliana on May 3 1982. The ban was also lifted and every year on November 28 the city of Haarlem organizes a commemorative ceremony in honour of the life and deeds of Hannie Schaft. Haarlems Dagblad 25-11-1995, Interview with Freddy Oversteegen.